The motivation for this project had nothing to do with home theater (since I don't have any such hardware); it had everything to do with cleaning out my garage of spare building materials ! In addition, I wanted to do some more veneering so that I could try some different techniques and products. The purist would claim that all speakers in a home theater system should use the same drivers to obtain matched timbre. 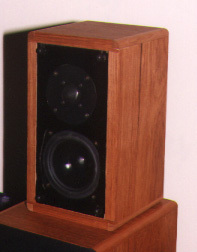 While this is a lofty goal, the practical part of me said that I wanted to build these speakers at an absolute minimum cost, below even that which I spent on my main 2-way satellites. The simple fact of the matter is that this project is an experiment first, and a real speaker second. That's the mentality at the onset - low cost, use up leftover building materials, learn more about building speakers and veneering. Secondary goals were to match the original satellites as closely as possible, when possible. I started searching for a low cost woofer capable of an F3 of no higher than 100 Hz in a reasonably small box. (Yes I realize Dolby Digital calls for full range speakers all around, but there's just no way that'll ever pass the SAF test :) My search ended at the Madisound web page where they had the Vifa C-13SG-15 for $12.00 USD each. This is a semi-shielded (bucking magnet) 5 inch doped paper cone woofer with a rubber surround. Important specs include : Fs 49 Hz, Vas 16 liters, Qms 2.1, Qes 0.44, Qts 0.36, impedance 9 ohms, 89 dB. A sealed 0.2 cu. ft. box yields an F2 of about 100 Hz. Since the main satellites used a Vifa aluminum tweeter, I decided that at the very least, I would use a metal tweeter for this speaker. I went with the SEAS 25 TAF/G (H398) from Zalytron. This is a one inch aluminum dome tweeter rated at 90 dB. Cost was $15.00 USD each on sale. There are three parts to the circuit - a second order L-R network at 4 kHz, a tweeter attenuator, and an impedance compensation network for the woofer. The intended positioning of the speaker is about 2 inches from the wall so this is how it was measured during crossover construction. The tweeter's output measured about 6 dB higher than the woofer. Using parts on hand, I attenuated the tweeter with two resistors - a 5.6 ohm in parallel and a 3.3 ohm in series with the tweeter. Impedance compensation for the woofer consists of an 8 ohm non-inductive resistor and a 9 mfd capacitor. The second-order L-R network has a 3.3 mfd capacitor and 0.45 mH inductor for the tweeter and a 0.5 mH inductor and 3 mfd capacitor for the woofer. Note that the tweeter is wired in-phase with the woofer. All resistors are 20 or 25 watt devices; capacitors are all mylar; and inductors are 19 gauge air core. All parts are from Madisound including many from their clearance sales. If the above description fails to make sense, I suggest reading Vance Dickason's Loudspeaker Design Cookbook first. This is an excellent book on speaker building and is available from various sources including Audio Amateur Corporation. A Radio Shack SPL meter was used to measure the resulting in-room response. This meter really isn't much good beyond 10 kHz so I measured only from 80 Hz to 10 kHz. The F3 measured at about 100 Hz. Overall response was +/-3dB from 100 Hz to 10 kHz. In fact, it stayed within +/- 2dB most of the time, with the exception of the two measurement extremes and a small dip at about 250 Hz (probably caused by the room). The enclosure is made of 3/4 inch MDF and is veneered with rosewood on four sides. The front baffle and the back are painted flat black and given a gloss clear protective coating. The external dimensions (in inches) excluding the grill are roughly 7-3/8 wide by 13 tall by 7 deep. Drivers are mounted in recesses on the baffle with standard particle board square drive screws. Weatherstripping rope caulk is used to seal the drivers in their mounting areas. All panels are glued together with yellow carpenter's glue. Small wood blocks are also glued to the inside corners for added strength. All internal seams are also caulked. The four edges where the top/bottom and sides meet are cut off and replaced with a piece of solid chery. A 1/4 inch roundover on the cherry softens the edge. The top/bottom/sides are veneered after assembly. The final finish is Danish oil and wax. The grill is made from a single piece of 5/8 inch plywood with most of the center removed. The plywood is first painted flat black, then the fabric stretched over, stappled and hot glued to the plywood. Ball and socket fasteners are used to hold the grill to the baffle. Each speaker has seperate high pass and low pass crossover boards mounted on either side of the box. 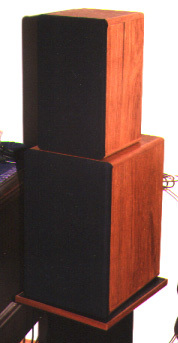 A standard square speaker cup is mounted in the rear. At right is the surround speaker and it's larger 2-way sibbling. Comparing these speakers to my main satellites, I'm inclined to say that I like these better. They have less of that "hollow" sound, have superior imaging and have a less pronounced high end. Naturally, the low end is lacking but that's part of the design. Perhaps the most enjoyable part of building these speakers is that I met my original goals. Everything except the inductors were purchased on sale or taken from my scrap/leftover heap. The design of the crossover was lots of fun and allowed me to match theory with reality. The only down side has been the veneering. The contact adhesive and veneer conditioner have not met my expectations.